The online version of this article ( https://doi.org/10.1186/s13075-019-1865-3) contains supplementary material, which is available to authorized users. Glycolytic metabolism is modulated by membrane glucose transporters (GLUTs), hexokinases (HKs) activity, and fructose 2,6-bisphosphate levels [8, 9, 10]. HKs catalyze the first committed step of glucose metabolism and glucose transported through GLUTs on the plasma membrane is phosphorylated by HKs to produce glucose-6-phosphate (G-6P) . There are four isoforms of HK-I, HK-II, HK-III, and HK-IV in mammalian tissues, and their main distributions differ in various tissues . Among them, HK-I, HK-II, and HK-III have higher affinity for glucose compared to HK-IV (also known as glucokinase) . Importantly, HK-I and HK-II were found to be overexpressed in many types of cancer [13, 14, 15], and specific inhibition of HK activity exhibits promising anti-cancer activities [16, 17]. Recently, HK-II was demonstrated to be related with the invasive and migratory phenotype of RASFs and holds potential as a treatment target for RA . 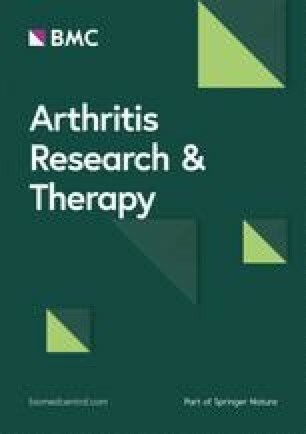 Here, we further identified that HK-I and HK-II were mainly expressed in the synovial tissues of RA patients when compared with those of OA patients, further supporting their likely involvement in RA. 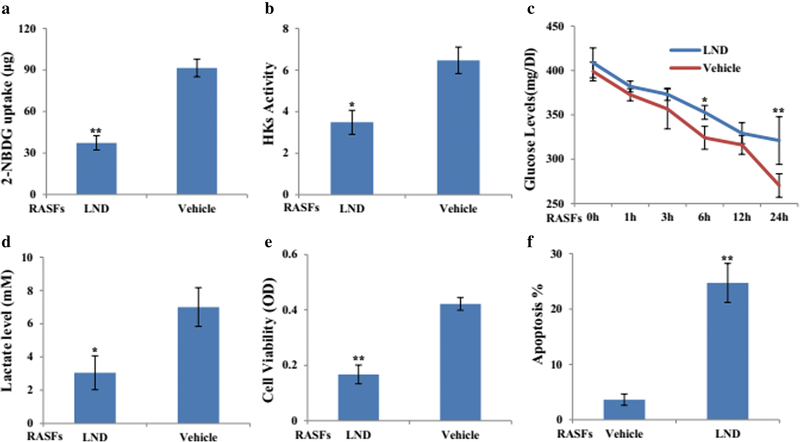 RASFs not only constitute a cellular mesh for the inflammatory process that characterizes RA, but also acquire a permanently aggressive, tumor-like phenotype that can initiate and perpetuate RA . Of note, tumor cells rely on a peculiar shift to aerobic glycolysis-dependent metabolism (the Warburg effect) as the main energy source to sustain their uncontrolled growth and proliferation . Since Warburg metabolism is also relevant to inflammation, the approaches disrupting it may also be applicable for treating inflammatory disorders . In RA, it is recently reported that the balance between glycolysis and oxidative phosphorylation was shifted toward glycolysis in RASFs [2, 3, 4, 5, 6]. Importantly, inhibition of the glycolytic activity of 6-phosphofructo-2-kinase/fructose-2, 6-bisphosphatase 3 (PFKFB3) not only impaired cytokine secretion and decreased cell proliferation and migration of RASFs, but also ameliorated the onset and severity in an arthritis model . Therefore, blocking glycolysis in RASFs might be a feasible strategy for RA treatment. In this study, our data showed that specific silencing of HK-I/II could inhibit the production of cytokines and chemokine in response to pro-inflammatory factors, thus providing evidence that HK-I/II may be related with the inflammatory phenotype of RASFs. Hypoxia is important in driving inflammatory responses of RA that could activate the genes encoding nearly every step of glycolysis . In response to hypoxia, the residing cells in joints, such as RASFs and macrophages, produced a large amount of proinflammatory factors that foster monocyte recruitment, neovascularization and bone destruction [28, 29]. Especially, glycolysis and inflammation are closely related in macrophage and mainly depend on the effect of hypoxia on glucose uptake and HK-I/II activities . In fact, it has been demonstrated that HK2 activation and glycolytic activity are required for protecting tumor cells, such as DLBCL, lung cancer, and prostate cancer, to enter into an adaptive process under hypoxic stress [30, 31, 32]. Hypoxia, glycolysis, and inflammation are hence interconnected during RA progression. In this study, HK-I/II expression in RASFs and THP1-derived macrophages could be induced by overlapping inflammatory factors and hypoxia, indicating that the glycolytic activity mediated by HK-I/II is required for sustaining the inflammatory phenotype under hypoxic condition in RA.